So how did the planned 35 mile Umstead training run go? Well as you can see from the picture it got off to a great start with three lovely companions, Katie, Laura and Karla. Alan took the picture and was running with us too but he's not as pretty as the ladies. I was expecting more to show up so we waited until nearly 8:45 to start and it was already quite warm. Finally decided the other 5 or 6 weren't coming so we took off. It didn't take long for Karla and I to be running alone as we were a little too slow for the others. That was OK. I have had so few opportunities to run with the Marathon Princess lately so we were having a great time enjoying the beautiful morning together. Karla hasn't worked her way back into shape yet to go the full lap comfortably, so when we got back to Graylyn after about 7 miles, we said good-bye and I settled in for the long day ahead. It was just then that I realized we had not stopped at the water fountain to refill my bottle and there would be no more chances for the next 6.6 miles. I was still feeling very good though and not too worried. As I worked my way around the Turkey Creek loop, I looked ahead and saw Laura running towards me with Barbara, about two miles from the parking lot. The three of us continued on and I was glad to have the company again. We finished that lap in 2:31, only a minute off my estimate. 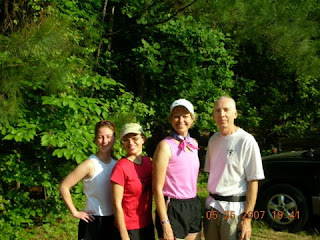 I drank nearly a whole bottle of water and took in some calories and after a short break Barbara and I said good-bye to Laura, Alan and Katie and headed out for lap two. The next several miles passed quickly. We were having a good time talking and getting to know each other better. Barbara will be running Western States also and has paced a friend over the last 38 miles of the course so we certainly had a lot to talk about on that subject. I was still feeling great as we left Turkey Creek and headed down Reedy Creek Trail. It's amazing how fast things can change. In less than 2 miles I went from feeling good to feeling very bad. By the time we reached the water fountain, around 21 miles into the run for me I was in trouble. I sat and poured some cold water over me and drank and ate a gel, took two e-caps and rested for about 5 minutes. Then we started off walking. I was hoping that I would feel better in a few minutes. We finally started running some more but by the time we reached the turn-around point at the gate, I was toast. We walked along and I still was getting worse instead of better. I began looking around for a place in the shade to sit but slowly trudged along hoping to make it back to the water fountain. I told Barbara to go ahead , that I would rest and cool off and I'd be fine to walk to the car in a little while and she could go ahead with the workout. Being the caring, compassionate Dr. that she is, she declined and stayed watching over me. I told her again a few minutes later to go ahead but then she noticed that it was possible to drive to the gate at the water fountain on the road that leads to Camp Lapihio. Not really looking forward to the long hot 3 mile walk back to my car I took her up on the offer. So she took off running to get her car and I found a nice old log in the shade to sit on and wait. It's amazing how many hundreds of ants, other insects and spiders live on one old log. I also had a visit from a lizard about 8" long. After the time I estimated it would take her to reach her car I walked towards the camp to meet her at the intersection at the camp entrance so it would be easier for her to turn around. I had only been there a minute when she drove up. So my planned run ended after 24.3 miles and hopefully I learned a lesson. It was all great fun for a while. Thanks Barbara.